This EID, elate your guests with something delectable. Chicken will always remain a favorite choice for simple to cook appetizers. Your guests will love this scrumptious chicken dish. This dish is simple and easy to cook. On such an auspicious occasion as EID, being prepared for guests with somehow delicious and appetizing is a task. You must have tried almost every chicken appetizer. Is there anything left that you can cook and woo your guests this EID? 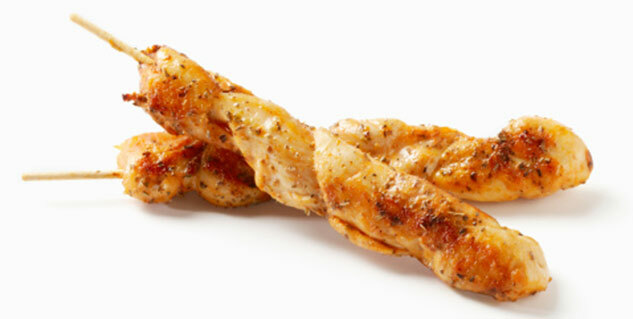 If you are not able to think of anything to cook for your guests on this EID, let’s make lip smacking chicken sticks. The recipe is easy and simple and you can make your guests drool with just the aroma of it. Mix all the ingredients in a bowl. Keep aside in a fridge. Mix all the marinade ingredients in a mixer and make a smooth paste. Now, cut the chicken in strips. Make sure that the strips are nor too thin nor too thick. Toss the strips in marinade and coat the chicken pieces well in the marinade. Keep the chicken aside for 4 to 5 hours in fridge. Preheat the grill. Grease the foil and line it in the baking tray. Place the chicken in the baking tray. Cook in hot grill for n10 to 15 minutes, do not overcook. Chicken must remain tender. Pierce cocktail sticks through the cooked chicken strips. Serve hot with the yogurt chutney.